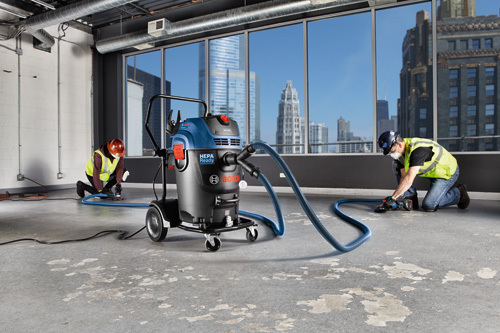 The Bosch 300-CFM Dust Extractor delivers the high-performance cubic-feet-of-air-per-minute (CFM) rate for maximum dust extraction for heavy-duty concrete construction applications such as concrete cutting and surface grinding. The dust extractor’s powerful 17.5 Amp motor delivers a maximum 300 CFM, and it is designed to help users move toward compliance with the OSHA Silica Table 1 dust compliance regulation. The automatic on-board filter-cleaning system activates every 15 seconds to help maintain maximum suction power. The included HEPA filter captures 99.97% of particles at 0.3 microns and larger. The included three-layer heavy-duty filter bag helps to protect the filter and provides the optimal containment of dry dust. It also provides wet/dry operation, with a water-level sensor and drain hose. The extractor features a wheeled metal frame with dumping mechanism, metal castors and a height-adjustable push handle. This unit includes a 16 Ft. 35mm anti-static hose and 27 Ft. power cord with standard 20 Amp plug. 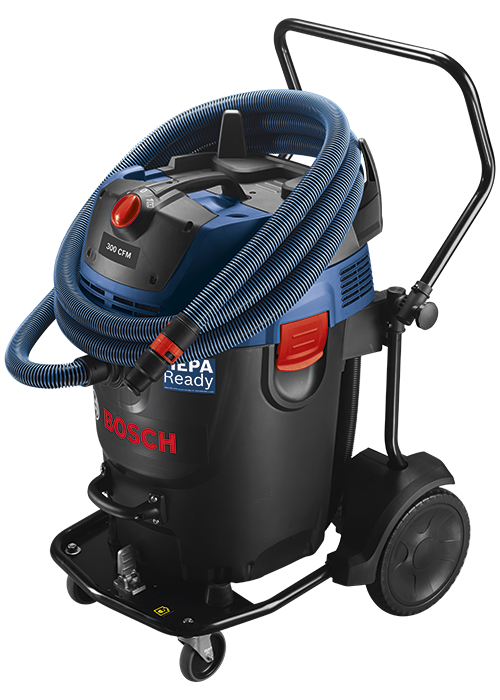 When used with the optional Y-Connect (sold separately), the dust extractor can be hooked up to two tools (such as small angle grinders when used in grinding or cutting concrete).